Mix filling (first 4 ingredients, and orange rind if using) all together until well blended. Put the filling in a piping bag, or a large zip-lock and cut the end to create a piping bag. 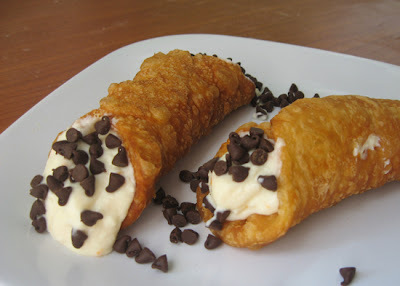 Fill the cannoli shells from each end. Add chocolate chips to ends. If not serving right away, store the filling in the refrigerator and fill the shells right before youserve the dessert. Shells will become soggy if filled too early.